The National Academy of Sciences was established in 1863 in order to meet the government’s urgent need for an independent adviser on scientific matters. President Lincoln signed a congressional charter forming the academy to “investigate, examine, experiment, and report upon any subject of science.” As science began to play an ever-increasing role in national priorities and public life, the National Academy of Sciences eventually expanded to include the National Research Council in 1916, the National Academy of Engineering in 1964, and the National Academy of Medicine, which was established in 1970 as the Institute of Medicine. Today, The National Academies of Sciences, Engineering, and Medicine are private, nonprofit institutions that provide expert advice on some of the most pressing challenges facing the nation and the world. Their work helps shape sound policies, inform public opinion and advance the pursuit of science, engineering and medicine. 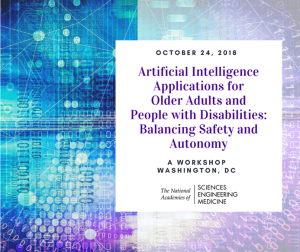 This particular workshop was convened by the Forum on Aging, Disability, and Independence for the purpose of exploring the potential of artificial intelligence to foster a balance of safety and autonomy for older adults and people with disabilities who strive to live as independently as possible. The workshop was a huge success by all counts and has created a lot of excitement and engagement among Forum members. We were particularly pleased to be a part of the event, because, at Viibrant, we believe in innovation for the purpose of enabling seniors to not only lead safe and independent lives, but to also lead vibrant, rich lives. That’s the reason we were out in front with voice recognition technology, and it’s the reason we will also leverage AI for the benefit of those we serve.